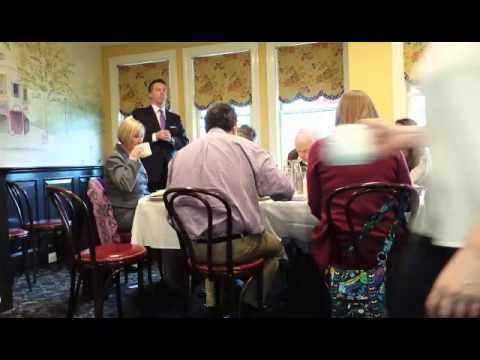 This story has been updated with a new video. 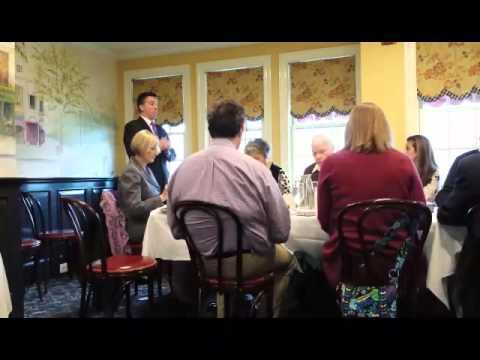 RYE, N.Y. -- Local Rotary Club members were treated to an informative talk by the City of Rye's new police commissioner Thursday during at breakfast at Ruby's Bar & Bistro. Commissioner Michael C. Corcoran Jr. detailed recent personnel changes, initiatives, policies and objectives since assuming command at Rye Police Department on Feb. 1. Corcoran served in West Orange, N.J., for 25 years, most recently as deputy chief, and received a law degree in 2002. The father of three boys has started an "adopt-a-school program" with increased involvement of officers in Rye schools, and discussed the importance of cracking down on drug trafficking along Interstates 95 and 287, which pass through the city. Officers will speak to local students about Internet safety, "stranger danger" and bike safety, among other topics, he said. "We're going to take a more proactive and progressive role on drugs,'' he said. Corcoran plans to restore a youth officer to the roster, maximize the skills of Rye's five female officers, make better use of social media to keep the public quickly informed of police activity and reward top patrol officers. Two will be promoted to sergeant on Friday and a sergeant was transferred to RPD's Detective Division on Monday. Corcoran said he encourages his officers to be courteous, friendly and respectful to Rye's residents and visitors -- saying hello and waving. More about Corcoran's background and hiring, which Rye City Manager Marcus Serrano called "one of my most important and proud moments of my life," can be read here. Corcoran said the Rye Police Department has a dropbox for unused prescription drugs so children are not inadvertently being introduced to Oxycontin, Xanax or other potentially addictive drugs from "mom and dad's medicine cabinet. . . . It's no secret drugs are a problem in our society." "It's a tragedy we have kids going off to college or even in high school involved in drugs,'' Corcoran said. "Know who your friends are. Know that one bad decision can absolutely ruin your life." Return to Daily Voice for coverage of Friday's promotion ceremony for Rye Police Officers Jason Washco and Edward Balls.